The Diana Watch is named after the ancient Mediterranean goddess Diana, known also as Artemis. The beloved daughter of Jupiter embodied the Moon for the ancient Romans. Every evening she enters her chariot and milk white stallions drive her across the sky. The case, in 18kt white gold, measures 40mm x 12mm. The bezel and lugs are covered in diamonds. It has double sapphire crystals. The crown features a black pearl. Telling “Moon” time is easy. When the”mirror” is at the 6 o’clock position, the entire mirror is filled with light, which signifies that the Moon is full. Naturally, when the Moon is new, the entire mirror is dark. All of the other phases of the waxing and waning Moon are indicated by how much bright surface versus dark surface is encircled by the “mirror”. 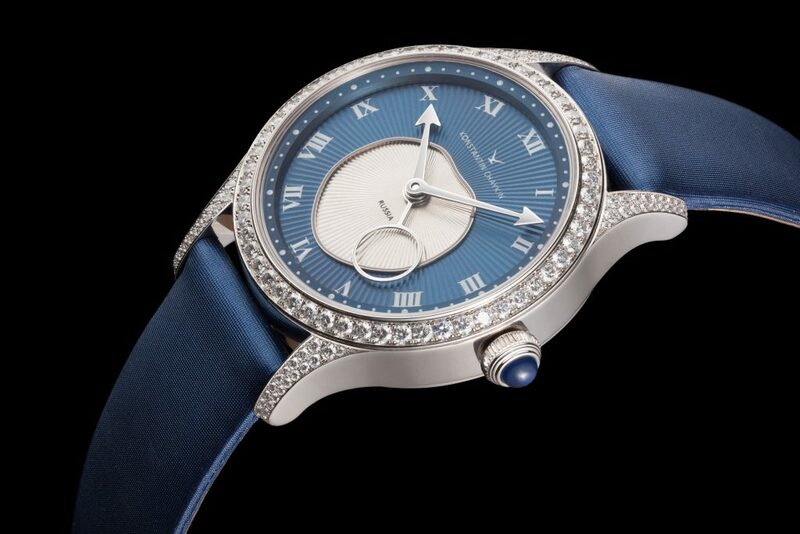 The strap is blue silk with an 18kt white gold buckle.